The summer heat is in full swing here. We’re hoping today is going to be cooler, but I’m not going to hold my breath on it. We have been gobbling down freezies, by the box it seems. Anything to cool us off even for a few minutes. Last week we had a couple recipes linked up to make your own cool treats. 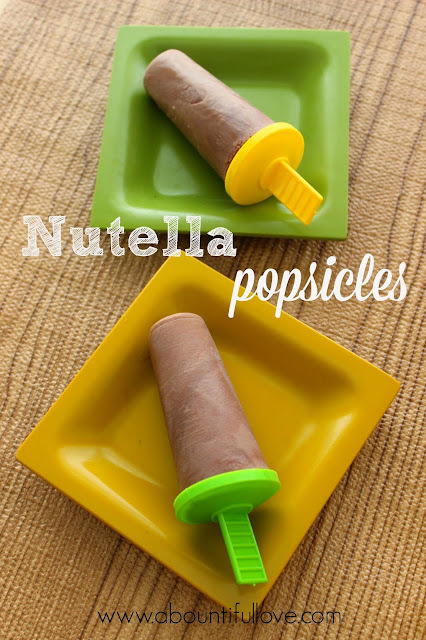 Now, my kids love Nutella, where as I can’t stand the taste of it… I can make these for my kids without fear of eating them myself. Win – win! My husband is addicted to space pops, it is the funniest thing, I don’t mean only in the heat of the summer, but all year around. Maybe I can make them for him to enjoy now.